Pop that TV dinner into the oven and pull up a tray as we watch Tarot videos on YouTube, Vimeo, and other visual media sites on the internet. Oracle Soup podcast explores video blogging as we welcome Angelo Nasios for a Kitchen Table Conversation. 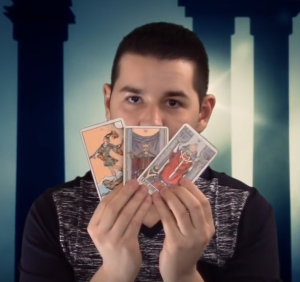 “A great card invites you in…” Erik C. Dunne → ← Stop…Do you really need that new deck?